The article is devoted to studying of mechanisms of destruction of fire-bars of kilning machines. It is established that destruction of fire-bar is the result of formation of small cracks on its surface and therefore there is a deformation of fire-bar. Deformation speed increases considerably because of presence at fire-bar of shrinkable blisters. There is a suggestion to pay the main attention to control of filling temperature of steel. Keywords:Heat-resistant steel, fire-bars, structure, filling temperature, carbides. Nikitin V.I., Krivopalov D.S., Nikitin K.V., Napalkov V.I., Makhov S.V., Duzhenko A.A. Effect of crystallization conditions on the structure of the inoculating Al-Sc master alloy Were influenced by special methods of treatment on the structure and properties of modifying maste alloys Al–Sc. For the first time held a large amount of experiments designed to produce fine-grained aluminum master alloys with scandium. The most effective methods of obtaining high ligatures modifying ability based on patterns of structural heredity. Key words:Scandium, grained ligature, intermetallics, heredity, microstructure, cooling rate, transition metals, crystallization, structural heredity. Increased requirements to the quality of shaped castings made of aluminum alloys used in aviation, involves performing a number of control operations, including nondestructive testing methods. One of the main methods of non-destructive control is the control of castings usingx-ray. In VIAM were developed scale x-ray standards gas porosity of the castings from the series of aluminum alloys of two systems: the system Al–Si–Mg (alloy type silumin), the system Al–Cu–Mn (alloys type solid solution). The article shows that such standards make it possible to determine their quality by comparing the reference x-ray with x-ray any specific shapes of serial casting of aluminum alloys of the type silumin and type solid solution without destroying casting fillet samples for testing. Key words:Casting of aluminum alloys, internal defects, shrinkage porosity, crystallization rate. The basic components of an antipenetration wash – refractory filler, binder, disperse medium, and process additives providing a complex of their beneficial properties. Density and viscosity are correlated, and effect of these parameters on shrinkage and covering capacity of washes is revealed, the meaning of the term is disclosed, and exprimental methods are described. The largest thickness of wash layer is obtained at the first washing. As the wash layer dries, its thickness decreases due to shrinkage during evaporation of the disperse medium. Analysis of causes of worsening adhesion of the wash to a polystyrene foam pattern in consumable pattern casting technology is given. Keywords:Antipenetration washes, water- and alcohol-based, viscosity, shrinkage, covering capacity, binder, refractory filler, process additives, sedimentation stability, zircon, disthenesillimanite, chromite, magnesite, corundum, graphite. Provides a method for casting patterns of expanded polystyrene (EPS) for the removal of the sand mold these patterns after shrinkage due to the heat, called thermal compaction. The temperature and duration of heating EPS samples to remove patterns and compacting waste EPS determined experimentally. Examples and advantages of the method, as well as the recommendations of its use in foundries described. Keywords:Casting for removable patterns, Lost Foam Casting, blades of gas turbine engines, the patterns of EPS, waste management. Discussed are the issues of the effect of geometrical parameters of mold channels and pressing velocity on the fillability in casting silumins with crystallization under pressure. Determined are process parameters allowing to prevent casting defects. Keywords:Die, fillability, alloy, pressing velocity, channels, filling defects, melt flow. The effectiveness of computing the temperature field in casting for technology simulation and defects prediction with use of WinCast software was analyzed. An algorithm of generating and processing the global matrix for layered finite element mesh in parallel computing system was considered. It was shown that the CAE program could be used for operational control of cast processes in automated foundry production. Keywords:Casting, computer simulation, WinCast, CAE, FEM. 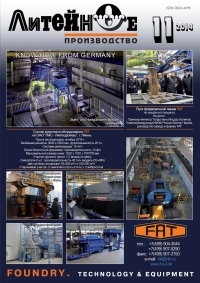 Innovation technology and facilities implementation in foundry engineering for quality and productivity improvement of the output product and new product range absorption is described in the article. Key words:“Alpha-set process, computer modeling with “SolidCast” program, process and operation simplification. Analysis of experience in conducting advanced traning courses shows the necessity of making sure that the conditions set forth in the article are met. There has been developed a program “modern methods of casting quality management” providing qualitative changing of professional competences necessary for using modern computer facilities for casting quality management, system approach to solving manufacturing problems and competent choice of new foundry technologies for own production facility. Key words:Casting rejects level, casting defectiveness, computer facilities, system approach.